Almost five months after the Canon complaint was lodged with the ITC back on February 28, 2018, a significant development occurred last Friday, July 27, 2018, with the issuance of the ITC Staff's brief in preparation for the Markman hearing on claim construction that's scheduled to take place August 30, 2018. We previously published a blog on the decision to include a Markman hearing as part of the investigation, which included an explanation of what would be involved. ALJ Sandra (Dee) Lord, who was assigned the case, has precedent to favor including a Markman hearing as part of an investigation, as opposed to ALJ Shaw who handled the previous Canon complaints (Cases '829 & '918 from 2012 and 2014 respectively), who did not. While the Markman hearing may have implications for any validity challenge to the asserted patents, it is chiefly concerned with the issue of (non) infringement, and presents an opportunity for the Complainant (Canon) to present its case for explaining to the ALJ the patent claims in a way that supports its infringement allegations and for the respondents to present theirs in a way that supports their non-infringement defense. The issue for the Markman hearing is to determine how the asserted claims of the patent should be interpreted and is an important milestone in the investigation. 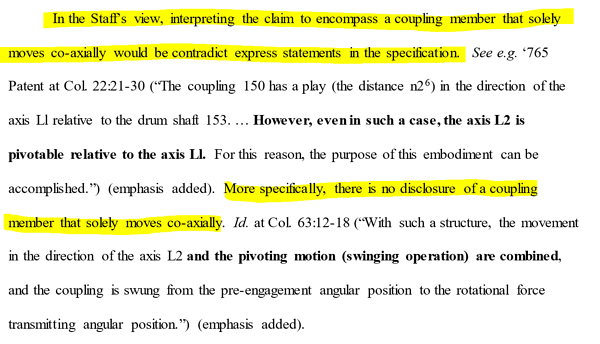 The Complainant (Canon) takes the position that the “plain language” of the claims encompasses "axial only" movement (movement of the coupling member in the direction of the long axis of the drum unit), and should not be limited to pivoting (inclination of the coupling member away from the long axis of the drum unit), since the key to their original invention is having a coupling incline or pivot to permit insertion of the cartridge into the printer without having to move the drive shaft. 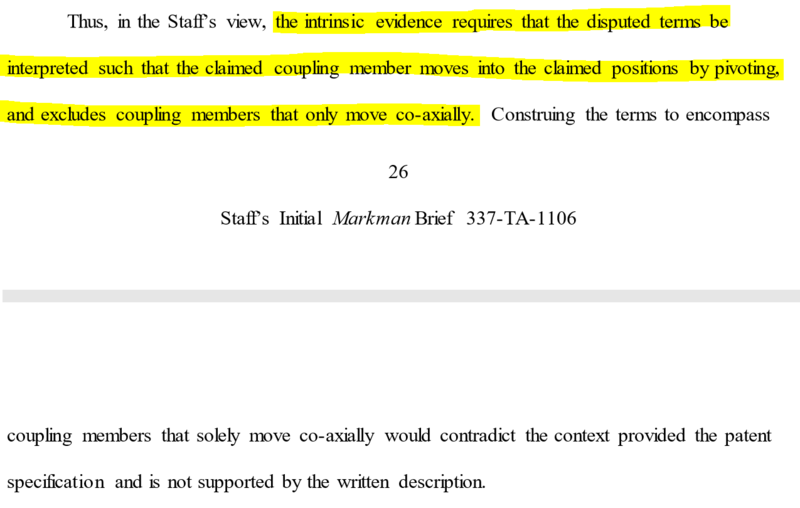 The Respondents take the position that the claims should be limited to couplings that pivot or incline, and should not be interpreted to cover couplings that move in and out, co-axially only, without pivoting, as incorporated in their redesigns. Both Canon's position and the Respondent's position were previously and publicly established (in the case of Canon) by way of the initial filing of the complaint and, (in the case of the respondents), by way of their initial replies to the complaint. The basis of the two sides arguments for and against infringement was therefore already broadly understood. So, what we're particularly interested in is the Staff's brief because, up to this point, it has been unknown how the attorneys of the Commission Staff (which is a party to the investigation with the mandate to protect the "public interest") may view the two opposing positions. This document thereby provides us with a clear indication of which argument the Staff leans toward. With that said, it should be noted that the ITC Staff is a neutral third party, whose position is often persuasive to, but never binding on, the ALJ and the Commission. Reply briefs are due from the parties by August 16, 2019, and, once the Markman hearing itself has taken place, there is a precedent in ALJ Lord's history of ITC investigations that a Markman hearing order may be issued. Should this be the case, then we would expect for it to be issued sometime after the projected date for completion of the expert discovery (September 29, 2018) and in advance of the trial scheduled to start January 29, 2019. What does the Staff's Brief say? In short, the Staff has repudiated the entire premise of the '1106 investigation requested by Canon. It has dismissed the notion that Canon can write new patents claiming priority to a patent originally written to cover a gear that inclines so that the new patents cover a gear that does not incline. The new patents that Canon obtained (nine of which were introduced to the '1106 investigation) cover all the respondent's design-around's that were introduced to avoid the claims of the patents asserted in the 2014 '918 ITC investigation. The Staff's views appear to be highly persuasive and the position as set forth in the Staff's Markman brief, if adopted by the ALJ and the Commission, will ultimately end the case with a defeat for Canon. However, even if ALJ Lord does issue a Markman hearing order in advance of the trial, and regardless of whether such an order was to agree with the Staff's brief, it would not affect Canon's ongoing right to see out the investigation. Never mind how damaging a potential Markman hearing order may be (should it agree with the Staff's claim construction brief), unless Canon decides to enter into settlement discussions with the Respondents that are subsequently concluded to all the parties satisfaction, the investigation will proceed and the trial will take place. At the trial, regardless of the Staff's brief, and regardless of a potentially adverse Markman hearing order, Canon will present its evidence of infringement based on its claim construction, just as the Respondents will do for theirs. Canon will do this in order to place its arguments for its claim construction (and thereby its case for infringement) on the record as will be necessary for a potential appeal should their complaint not be upheld. The trial will be followed by an Initial Determination from ALJ Lord and, even if this agrees with the Staff brief (and a potential Markman order agreeing with the Staff's brief), it must be understood that this would still only be an Initial Determination. There will be a four-month gap between the Initial Determination (March 29, 2019) and the Final Determination (July 29, 2019). During this four-month gap, it is logical to assume that Canon would certainly petition the full Commission to review and try to reverse an adverse Initial Determination. Furthermore, even assuming the Commission upholds the ALJ on this fundamental point, Canon would still have the right to appeal the Final Determination to the United States Court of Appeals for the Federal Circuit (CAFC). When the '1106 complaint was filed on February 28, 2018, it resulted in a flurry of negative developments for the aftermarket new-build design-around cartridge manufacturers and their customers. Insinuations in a variety of publications that the accused cartridges were no more than "copycat" clones. At least one prominent OEM taking the opportunity to remind resellers of the risks of selling infringing cartridges and the impact that continued sale may have on authorizations to sell their OEM branded cartridges. A strongly worded letter sent to the members of a leading Buying Group that signaled withdrawal of support for certain new-build design-around cartridges. As a result, the prospects for new-build design-around cartridges continuing to build market share in established distribution channels took a significant turn for the worse. Furthermore, regardless of the eventual outcome of the '1106 investigation, immediate damage to the brands and the reputations of the new-build design-around manufacturers and their resellers took place. We have consistently taken a "black and white" view that, because new-build design-around cartridges are less expensive to manufacture than remanufactured cartridges and because, at least in theory, they should be higher quality than remanufactured cartridges because they only contain new parts, that new-build design-around cartridges will eventually eliminate remanufactured cartridges from the market. Even after the onset of this latest round of litigation, our view on this position did not change as we believe the well-capitalized, predominantly Chinese, new-build design-around manufacturers have sufficient financial and technical resources to continue to redesign components they are accused of infringing which, in turn, would ensure business ultimately continued as normal. Normal, however, is the key word here because recent "normal" for new-build design-around cartridges has been a continuing cycle of litigation that has fed campaigns (initiated by those with the most to lose) to spread fear, uncertainty, and doubt, that have served their purpose in limiting their market penetration. However, should the ALJ and the Commission ultimately agree with the Staff's claim construction brief, the historical reluctance of the bigger players to introduce these design-around products to the distribution channels, a significant part of which has been cultivated by the fear, uncertainty, and doubt, may change. As such, again, should the Commission ultimately agree with the Staff's arguments, this Staff brief may prove to be a tipping event in the eventual outcome of the three-sided battle for share in the market for toner cartridges. On balance, we have to assume that, regardless of the Staff's brief on the claim construction, and regardless of a potentially damaging Markman hearing order, the chances are that Canon will not settle the dispute with the Respondents (at least not with all of them) and that the Investigation will proceed through trial and the Initial, and Final Determinations. However, should the claim construction remain consistent to the Staff's brief throughout the remainder of the Investigation, then there's the potential for a humiliating loss for Canon that's unlikely to have been anticipated as a probable outcome by any of the parties involved in the investigation - not least by Canon itself who may eventually lose the ability to enforce a handful of patents and thereby also be encouraged to consider its future litigation strategies very carefully. For the Respondents, while the Staff's brief is unquestionably a positive development that favors their argument, it is not a final determination because the claim construction as laid out in the brief may not be agreed with by ALJ Lord and the Commission. We will monitor, with great interest, for a potential Markman hearing order in the October 2018 time frame to learn if the Staff's brief on claim construction may be supported by the outcome of the hearing itself. To make sure you don't miss future content relating to the US ITC 337-TA-1106 investigation and other important developments in the office products and equipment industry, please click the link below to signup for our blog. Ian Elliott has over 35 years experience in the imaging supplies industry and, at prior places of employment, has faced direct involvement in OEM versus aftermarket patent litigation. Mr. Elliott is not a patent attorney, is not qualified to provide legal advice, and this article is not an attempt to provide any kind of legal advice. It represents no more than his views and opinions based on decades of relevant experience.